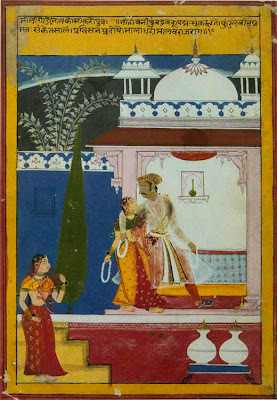 Sahibdin, Malavini Ragini: folio from a Ragamala series; Udaipur, Mewar, Rajasthan, 1628; opaque watercolor and ink on paper, 9 13/16 x 7 inches. I love the Metropolitan Museum of Art. The permanent collections are a marvel, which I never tire of exploring; there is always something new to discover. They also mount remarkable temporary exhibitions, that take me to new worlds, or expand and deepen my understanding of old ones. 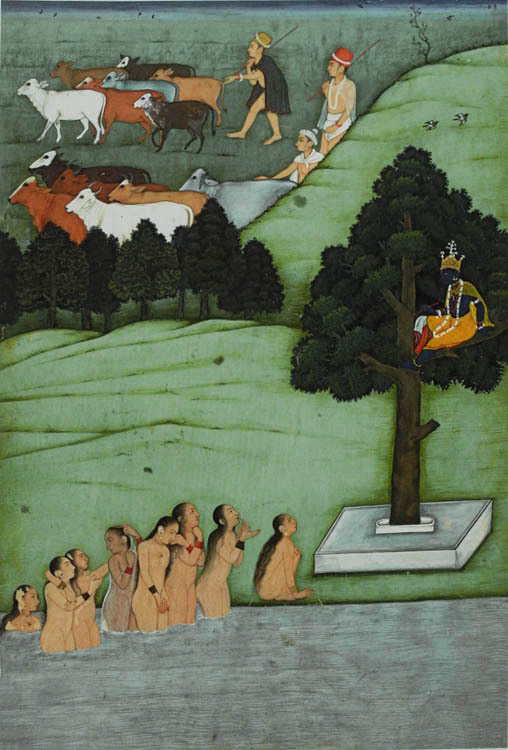 "Wonder of the Age: Master Painters of India, 1100-1900" is one of these enlightening and thrilling shows; on view until January 8th, I hope all of you who are able get to see it. The title of the show comes from its curatorial premise, that many of the works we had assumed were painted by anonymous artists were in fact by well known masters, who were "wonders of the age". This is a very large show, some 220 paintings, and there is so much to think about – narrative strategies, compositional and spacial structures, revelatory details, refined form, sheer beauty – that I decided to focus on color for this post. The museum website has some images online, but it is so limited that I decided to buy the catalog for the exhibition, and I photographed these paintings from it. The color is twice removed from the actual paintings, but I hope you can get some idea of it. I look at the early 17th century painting by Sahibdin and feel elated, buoyed by the vibrant colors and mellifluous shapes. Even white takes on a sparkle and presence and weight. Each color stands on its own, unmodulated, rich and sensuous. These two pots are wonderfully alive, bright white forms against the vivid red, as though symbolizing the passion of the two lovers above. 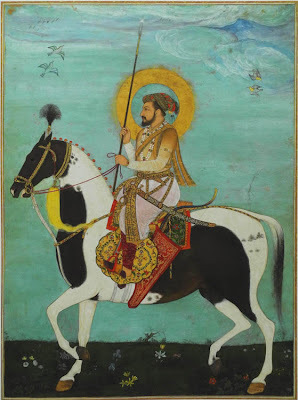 I had always loved the more detailed work of Mughal-style painting, but after seeing this show, the energy of bright flat colors totally engaged me. 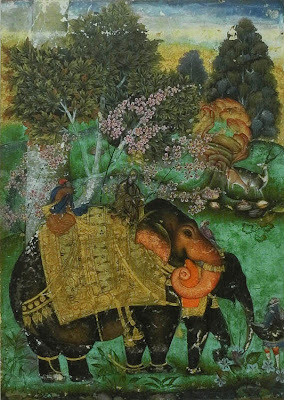 Farrukh Beg, Sultan Ibrahim Adil Shah II riding his prized elephant, Atash Khan; Bijapur, Deccan, ca. 1600; opaque watercolor and gold on paper, 5 5/8 x 4 1/16 inches. 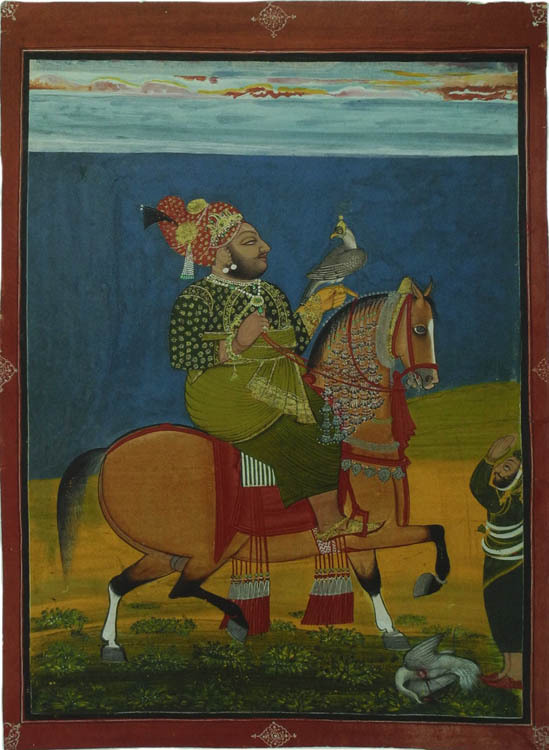 There are different styles in Indian painting, and this portrait is more refined and delicate than the Rajasthani painting above. 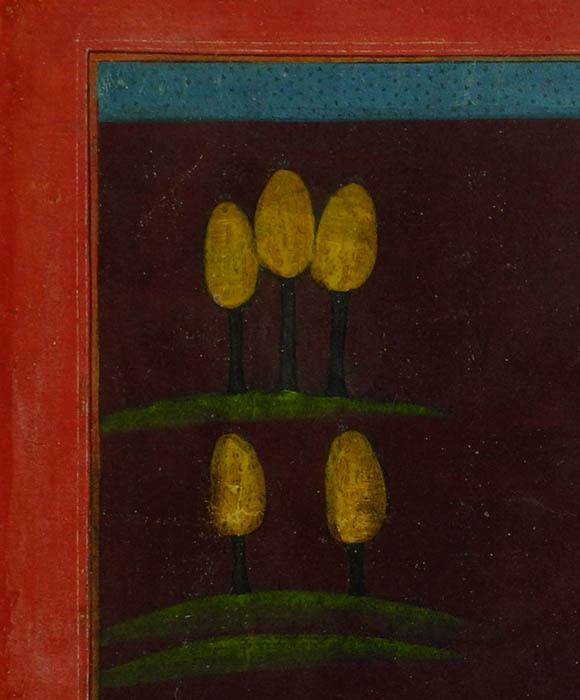 The accumulation of detail is delightful, within a gold and green landscape. 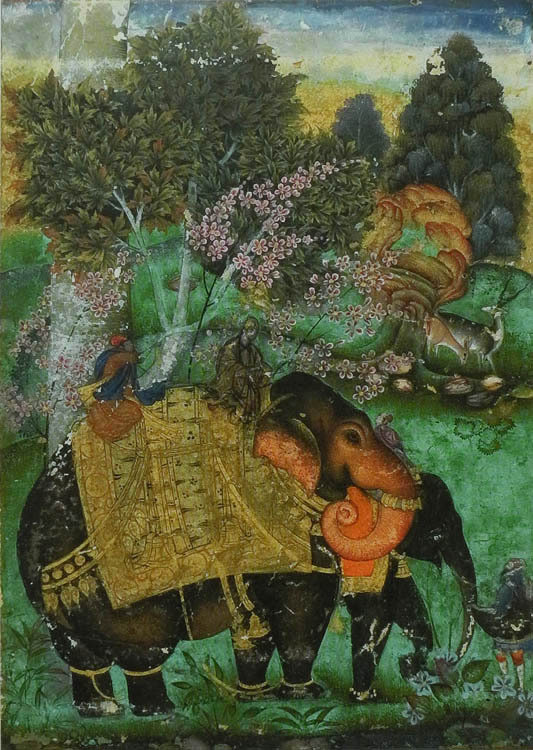 The sprays of pink flowers and the orange elephant's trunk are surprising jewel-like elements. Payag, Shah Jahan riding a stallion; Mughal court at Agra, ca. 1628; opaque watercolor and gold on paper, 11 1/8 x 8 3/16 inches. A black and white horse dramatically prances in a field of green. This beautiful cool green appears often in Indian painting. At the end of the exhibition there's a case with various pigments and tools used to make these paintings. I wish I'd taken notes, but I remember that a green pigment used was copper carbonate, also known as verdigris. If you're interested in learning more about ancient pigments, the book Materials and Techniques of Medieval Painting by Daniel V. Thompson, is a good guide. 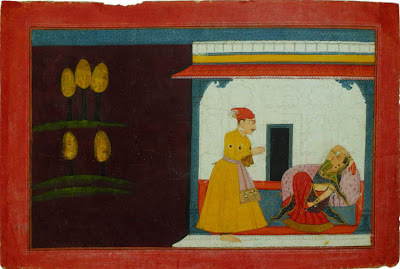 Early Master at the Court of Mandi, The gopis pleading with Krishna to return their clothes; Mandi, Himachal Pradesh, ca. 1635-50; opaque watercolor on paper; 11 3/4 x 7 3/4 inches. The same beautiful green appears here, in hills undulating upwards and backed by a distant gray-green, balanced by the gray of water in the foreground. The delicately warm colors of women's flesh and of cattle engage my eye and remind me of the story. Devidasa, Shiva and Parvati playing chaupar; Basohli, Jammu, 1694-95; opaque watercolor, ink, silver, gold on paper; 6 1/2 x 10 7/8 inches. In this painting, color seems so much a part of the narrative: the golden orange overlapped by nodding green trees glows, as in a heavenly place. The warm browny-red of the border accentuates the scene. What colors! orange-yellow, warm and cooler dark greens, the yellow of tiger skin, the red of game board and clothing and the dark red surround. Delicious. Golu, The lover prepares to depart; Nurpur, Himachal Pradesh, ca. 1710-20; opaque watercolor on paper; 6 7/8 x 10 5/8 inches. This is my favorite painting in the show, which I saw twice. The colors seem perfectly balanced and each is so beautifully rich. The division into lit interior and mysterious dark heightens the feeling of each space. 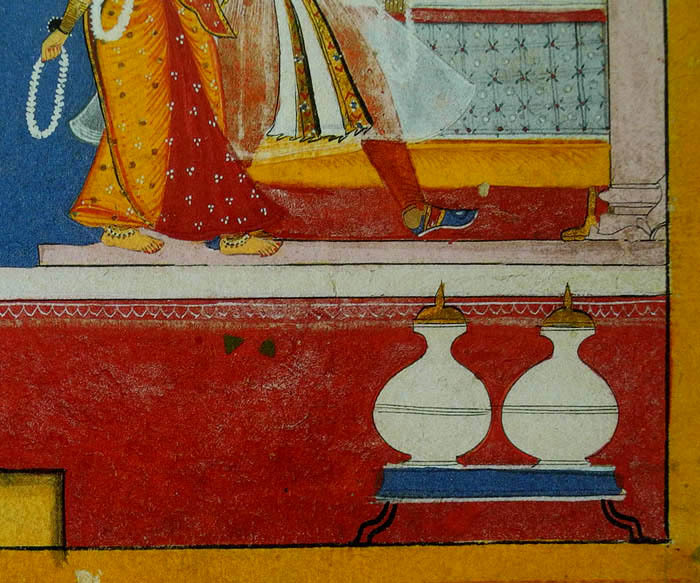 detail, The lover prepares to depart. This detail makes me swoon: the deep purply brown with the very simple overlays of golden oval trees, held up by arcs of green; the band of greenish blue, marked by small details; the gorgeous deep red. And all painted with precision of a fresh and open sort. Oh my. Manaku, South wind cools in the Himalayas; Guler, Himalchal Pradesh, 1730; opaque watercolor on paper; 8 3/8 x 12 1/16 inches. There were several paintings in the show of extravagantly colored mountains, the artists not being content with the grays and browns of rocky reaches. Bagta, Kunvar Anop Singh hawking; Devgarh, Mewar, Rajasthan, ca. 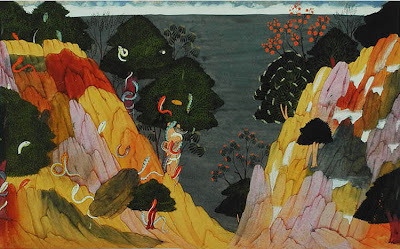 1777; opaque watercolor on paper; 14 3/16 x 10 7/16 inches. Both man and beast are gorgeously arrayed in this fairly large portrait. There are sumptuous details of jewels and patterned cloth, but they are subordinate to the overall color design of blue, orange-brown, and green, with red as punctuation. And of course the swelling form of prince and horse are elegantly and simply drawn; it is interesting to compare this painting to the ones above, of princes on horseback and on an elephant. Nainsukh, Portable Vishnu shrine; Guler, Himachal Pradesh, 1763; opaque watercolor and gold on paper; 5 29/32 x 7 1/2 inches. To end, I am showing a painting in which color is quiet, minimal, subtle. White is the mourning color in India, and scholars think that under the cloth at center are the ashes of Nainsukh's patron, Balwant Singh. The white, the gray, the green, the small stretch of blue at the top, with other small bits of color, make of a solemn moment a harmonious one; a painting perfect in its expression. 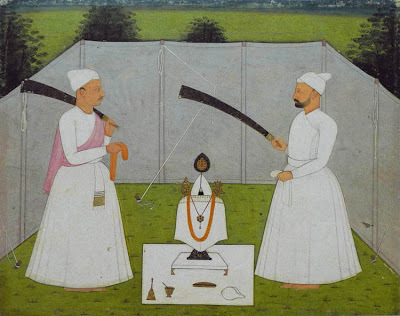 I feel that I have a great deal to learn from these master painters of India. Altoon, I know I won't get to see this in person, so thank you very much for posting. These are fantastic. I open your postings every time with my eyes wide open to learn something new; be it art history, techniques, personal sojourn of walks on your property and your lastest pieces of art. Never am I disappointed. I thank you for the inspirations and the new knowledge taken from your blog. 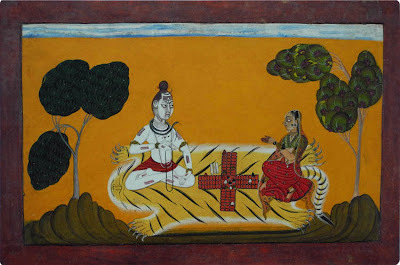 I love to look at Indian paintings and each time I see an exhibition of them I'm transfixed. Thanks for posting this, Altoon. 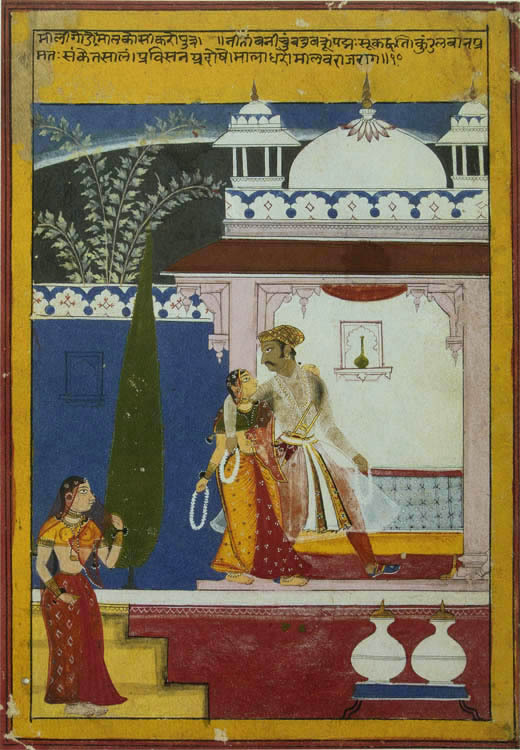 I wonder if the catalog mentions the relationship to musical themes in Rajput paintings. I'm glad you liked this post. I loved the show and wanted to share it. donna, I haven't read the catalog introduction, so am not sure about the relationship with music. Happy New Year! in Masereel's "The City"
A New Painting: "White Behind Red"